The Cybereye-mobile cam is a security camera that can be installed inside a car to verify the identity of people committing carjacking, robbery, car theft and vandalism. You can take B/W images of the criminal by pressing the emergency switch or using the auto detecting function. The recorded pictures of the criminal with a date and time stamp can be used as evidence by the police and in a court of law. Columbus, OH (PRWEB) January 20, 2005 -- 21st Century Locks, Ltd announces the addition of the CyberEye Wireless Camera for Vehicle Security (IC-100MA) to their product line. The IC-100MA automatically takes date and time stamped B/W photos when an intrusion is detected. Also included in the package is a foot operated switch to activate the camera in case of an emergency, e.g. robbery, car jacking, assault etc. 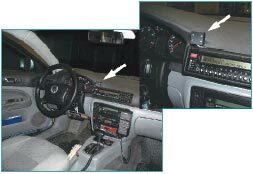 The use of the foot operated switch allows the driver to activate the camera without alerting the thief or assailant. By using infra red LED's the camera is able to capture images at night and in low light conditions. Captured images can be displayed on a TV or monitor to ascertain the identity of the offender as well as the date and time of the offence. For unattended operation the system can be armed/disarmed by using the supplied remote control keyfob. The addition of an optional wireless siren turns the system into an effective car alarm which not only alerts you to a break in but also takes photographs of the offender. 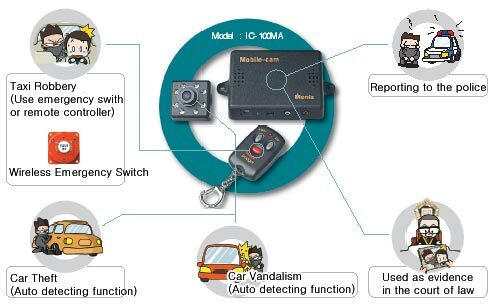 'I believe that this product will be of immense value to the taxi industry where drivers are constantly at risk of being robbed, assaulted or even murdered', said Rob van Gils, VP Sales & Marketing for 21st Century Locks, Ltd.
Activate and deactivate the camera with a remote controller. The camera can be installed near the rear view mirror, dashboard, etc. and a covert place like beneath seat for main unit, wireless siren (option) and wireless emergency switch (option). Simply connect to any TV or monitor and you can check the images.